Being a senior in high school, deciding where I want to go to college is very fun and stressful all at the same time. I am applying to around 22 schools because I do not have a favorite school. Most people have a top five, or even that one school they’ve been dreaming of going to since they could talk. Me? I love multiple schools from all over the country. I’m applying to the University of Oregon because it’s not too far away from home, it has an incredible international studies program, and the school is beautiful. I had never been to oregon before but my experience was outstanding. Although it was dreary and rainy, everything was so green and beautiful. The people were incredibly kind and I fell in love with the people and environment. My dad and I flew into Portland and then drove to Eugene from there. Our drive there was incredibly rainy. Not just typical rain drops, it was literally pouring buckets. Coming from Nevada, it was something else. The next day I sat in on a Russian 101 class which was a great experience and I really enjoyed the atmosphere. Even though there are around 20,000 students at U of O, I was pleased to see that class sizes could still be small. There were only seven students in the Russian class. After that we took a visit it to the International Studies headquarters where I met with an advisor and she gave me all the information I needed to know regarding my desired major. Once we were through with that, we quickly walked across campus to make our 11 o’clock tour. Our tour guide was great, giving me all the information I needed and showing me all parts of the campus. I fell in love with the campus on this tour. After the tour, my dad and I grabbed a bite to eat and headed back to the hotel room to rest a little. That night, I went out with my friend who goes to Oregon that I knew from my home town. 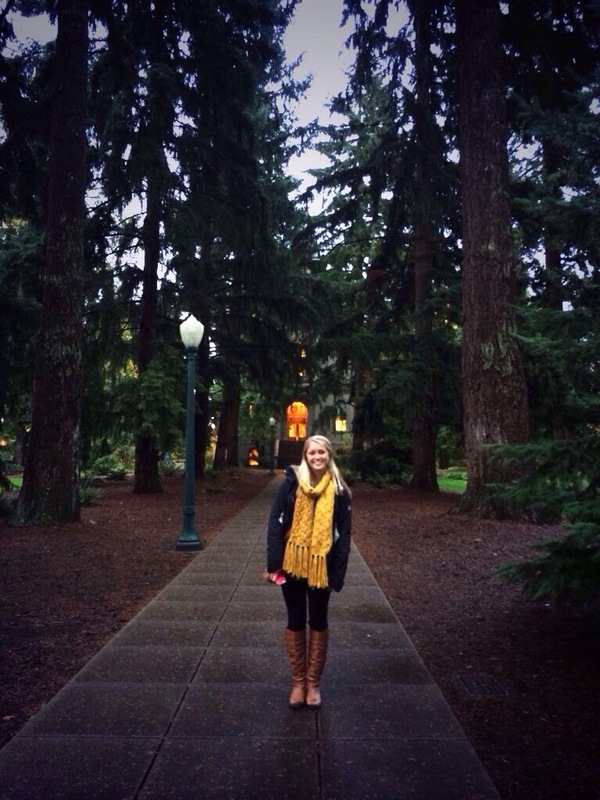 University of Oregon sure knows how to celebrate Halloween! It was a great night and gave me a real taste of the college life at the school. 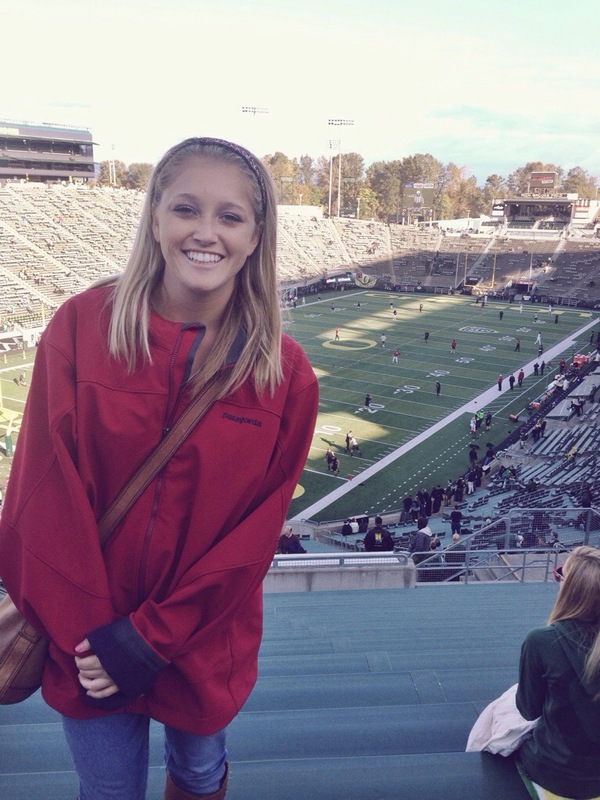 My dad is a Stanford alum, so it was only fitting to go to the Stanford/Oregon game on Saturday. 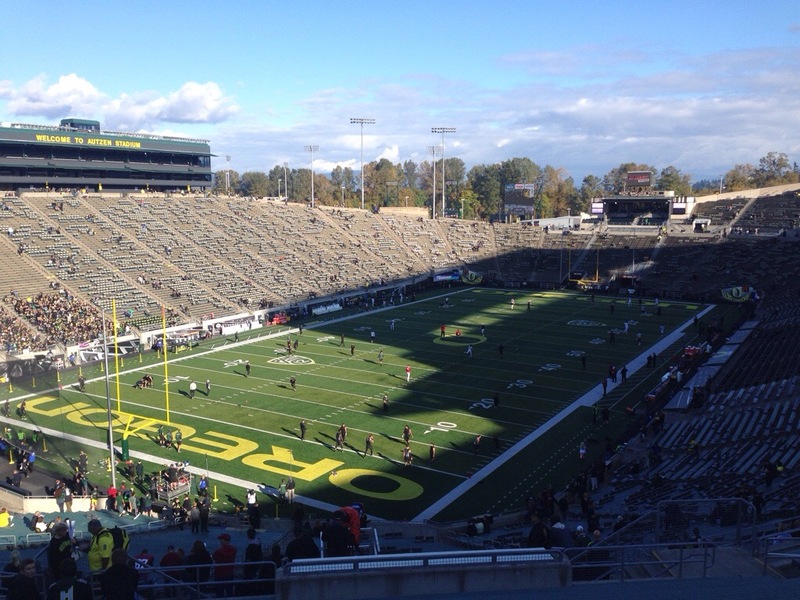 Autzen stadium was incredible and by far the nicest college football stadium I have seen so far. The fans were wild and I could really picture myself being one of them next year. Every single seat was filled and I was blown away by the camaraderie I witnessed. As I continue my college search, I will definitely keep Oregon high on my list. Go Ducks!